Monkelbaan, Joachim 2019. Governance for the Sustainable Development Goals. p. 193. Ràfols, Ismael 2019. S&T indicators in the wild: Contextualization and participation for responsible metrics. Research Evaluation, Vol. 28, Issue. 1, p. 7. Daviter, Falk 2019. Policy analysis in the face of complexity: What kind of knowledge to tackle wicked problems?. Public Policy and Administration, Vol. 34, Issue. 1, p. 62. Craig, Claire 2019. How Does Government Listen to Scientists?. p. 1. Jinnah, Sikina Nicholson, Simon and Flegal, Jane 2019. Toward Legitimate Governance of Solar Geoengineering Research: A Role for Sub-State Actors. Ethics, Policy & Environment, p. 1. Foulds, Chris and Robison, Rosie 2018. Advancing Energy Policy. p. 1. Thompson, Paul B. 2018. The roles of ethics in gene drive research and governance. Journal of Responsible Innovation, Vol. 5, Issue. sup1, p. S159. Floor, Judith R. van Koppen, C.S.A. (Kris) and van Tatenhove, Jan P.M. 2018. Knowledge uncertainties in environmental conflicts: how the mussel fishery controversy in the Dutch Wadden Sea became depoliticised. Environmental Politics, p. 1. Cairney, Paul and Rummery, Kirstein 2018. Feminising Politics to Close the Evidence-Policy Gap: The Case of Social Policy in Scotland. Australian Journal of Public Administration, Vol. 77, Issue. 4, p. 542. Flinders, Matthew 2018. the future of political science? the politics and management of the academic expectations gap: evidence from the UK. European Political Science, Vol. 17, Issue. 4, p. 587. Broström, Anders and McKelvey, Maureen 2018. Engaging Experts: Science-Policy Interactions and the Introduction of Congestion Charging in Stockholm. Minerva, Vol. 56, Issue. 2, p. 183. Bozeman, Barry Youtie, Jan Fukumoto, Eriko and Parker, Marla 2018. When Is Science Used in Science Policy? Examining the Importance of Scientific and Technical Information in National Research Council Reports. Review of Policy Research, p. e0001. Tinch, Rob Balian, Estelle Carss, Dave de Blas, Driss Ezzine Geamana, Nicoleta Adriana Heink, Ulrich Keune, Hans Nesshöver, Carsten Niemelä, Jari Sarkki, Simo Thibon, Maxime Timaeus, Johannes Vadineanu, Angheluta van den Hove, Sybille Watt, Allan Waylen, Kerry A. Wittmer, Heidi and Young, Juliette C. 2018. Science-policy interfaces for biodiversity: dynamic learning environments for successful impact. Biodiversity and Conservation, Vol. 27, Issue. 7, p. 1679. Ruser, Alexander 2018. Climate Politics and the Impact of Think Tanks. p. 43. Huitema, Dave Jordan, Andrew Munaretto, Stefania and Hildén, Mikael 2018. Policy experimentation: core concepts, political dynamics, governance and impacts. Policy Sciences, Vol. 51, Issue. 2, p. 143. Scientists have a choice concerning what role they should play in political debates and policy formation, particularly in terms of how they present their research. This book is about understanding this choice, what considerations are important to think about when deciding, and the consequences of such choices for the individual scientist and the broader scientific enterprise. Rather than prescribing what course of action each scientist ought to take, the book aims to identify a range of options for individual scientists to consider in making their own judgments about how they would like to position themselves in relation to policy and politics. 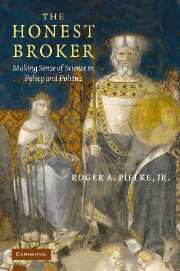 Using examples from a range of scientific controversies and thought-provoking analogies from other walks of life, The Honest Broker challenges us all - scientists, politicians and citizens - to think carefully about how best science can contribute to policy-making and a healthy democracy.